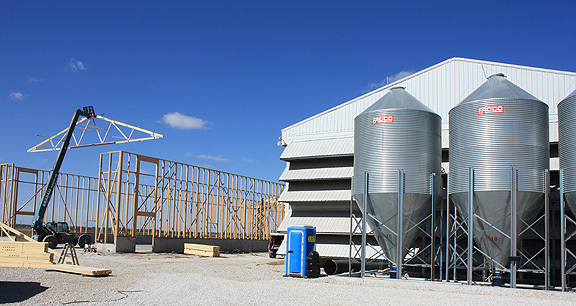 Project obstacles and solutions: River View Farms was expanding their poultry operations with a new barn in Washington, Indiana. River View Farms is one of the largest poultry producers in the Midwest. DCA Construction was hired to build a 60 x 480' barn. With 28,800 square feet of concrete pad to pour and a small crew, DCA was looking for a concrete mix that would set up slowly and give them time to finish it without adding water and compromising strength. IMI suggested they use imix Superslab, an interior concrete mix that stays wet for long periods of time and is designed to produce a creamy finishing paste. It is commonly used for pole barn and outbuilding floors. The DCA crews poured 435 yards of imix Superslab in two different pours. For more information on imix Superslab for interior floors or other concrete designed for small crews, click here.